Welcome to my home page. This website has been set up to enable family and friends to follow some of my activities and interests. As you will be able to see from the horizontal index-bar above the previous paragraph, the next page on my website is entitled CV. It covers some of my work as a political scientist, and it's where you can find a detailed version of my curriculum vitae, which contains information about the academic posts I have held and about political science courses I have recently taught. It also has a full list of all my academic publications – as well as links to some of them. Because legislatures and parliaments are an interest of mine that stems from my work as a political scientist, the section of this website devoted to legislatures and parliaments can be accessed either via my CV page or via the horizontal index-bar that is found immediately beneath the heading and photograph on each of the main pages of my website. By far the majority of the pages on my website are about activities and interests that I have in addition to conducting research, writing articles, and teaching university students about government and politics. My other interests include architecture; climbing; penguins; photography; running; and travel. There are separate links to each of these subjects, and there is also a link to web-pages about my family. * Links that are live (i.e., links that open other pages and files) are in blue. * Links that I am still working on and which have not yet been made operational are in brown. * Links that are in red show that you are already on that page. In view of my interest in photography, it shouldn't surprise you that my website includes a fair number of my photographs. If you want to use one or other of my photos for your own amateur purposes or for teaching or lecturing, then that's fine – just so long as you acknowledge the source of the pictures. However, if you want to use any of my photographs for commercial purposes, then you will need to obtain written permission from me prior to doing so and you will also have to pay a fee for using them. You can contact me by emailing me at the following address: Nigel.Roberts88vuw.ac.nz (in an attempt to avoid spam-inducing "crawlers" detecting and using my email address, I have used the figure 88 instead of @). Thank you. So, no matter whether you are family, friend, or a stranger who has come across this site either accidentally or via Google, I do hope that visiting this website will be either enjoyable or useful, or – better still – both. 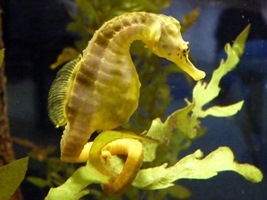 Finally, why is there a photo of a seahorse on my homepage? Well, my paternal grandmother's name was Olive Seaman and as a result of her maiden name, the seahorse is something of an unofficial family symbol.